Cuban and American Scientists work to bridge political gap between Cuba, U.S. In the process, they’re chipping away at a half-century of government feuding, helping to bring the nations together for talks on vital matters, such as what to do in case of an oil spill. The two countries are so geographically close, and the environmental concerns so similar, that scientists say it’s crucial to combine forces. “If we’re going to have any hope of protecting our environment in the future, from climate change to our shared resources in the Gulf of Mexico, we have to collaborate,” said Dan Whittle, the Cuba program director at the Environmental Defense Fund. Under the Obama administration, cooperation between scientific organizations has increased, scientists say. Visas are being granted more regularly to Cuban scientists and it’s easier for Americans to get the U.S. government licenses needed to do research on the island. Peter Agre, a Nobel laureate in chemistry and the head of the Johns Hopkins Malaria Research Institute, led 18 U.S. scientists associated with the American Association for the Advancement of Science on a trip to Cuba in December to meet with counterparts about potential cooperation in marine and atmospheric sciences, and sustainable fisheries. For some American scientists, going to Cuba is like tasting a piece of forbidden fruit. The scientific landscape has been largely untouched for decades. The U.S. trade embargo, which has been in place for 50 years, has in many ways been a gift to Cuba’s forests, fish populations and coral reefs. It helped insulate Cuba’s ecosystem from the type of tourist development that’s wracked other nations. Sea turtles that feed in Florida journey back each year to nest in Cuba. Many grunts and snapper fish that live off the North Carolina coast also spawn in Cuba. The oceanic whitetip shark has almost disappeared from U.S. waters, but preliminary studies show the predators in abundance around the island. Cuban scientists see the collaboration with Americans as an honest exchange of work, as opposed to a plea for funding or resources. They complain that they don’t get enough credit for their science, and they boast that Cuba represents 2 percent of the Latin American population but has 11 percent of the scientists in the region. There are thousands of Cuban doctors and health professionals on medical missions abroad. The country includes more than 84 protected areas, making up almost 14 percent of the island. In Western Cuba at the 37,500-acre Vinales National Park, environmentalists study ways to protect the vast mountains that are home to an array of native plants and animals, including the renown “painted snails.” Legend has it that the sun painted their vibrant orange and yellow swirled shells. Scientists and scholars have helped break through political barriers before. An environmental agreement reached with the Soviet Union in the 1970s is often credited with easing Cold War tensions. The researchers understand that anything involving Cuba is going to be controversial. A decision to grant President Raul Castro’s daughter a visa to attend an academic conference in San Francisco this week sparked a wave of criticism from Cuban-American groups, calling her an enemy of democracy. But the researchers say their work is focused on science, not politics. Their cooperation will serve as a foundation for future dialogue, they say. “The political relationship at some point, in five years, 50 years, 500 years, whatever it is, will change,” said Vaughan Turekian, an atmospheric geochemist and chief international officer at the American Association for the Advancement of Science. In a rare move last year, the Environmental Defense Fund received State Department approval to bring a senior official from the National Oceanic and Atmospheric Administration to Cuba to meet with officials about rebuilding fish stocks for species of fish that populate the region. Oil is a key area of cooperative interest. Scientists have helped facilitate talks between the nations as the specter of an oil spill has raised concerns in both of them. Cuban oceanographers reached out to their U.S. counterparts after the 2010 BP spill to help them gain reassurances that the U.S. government would step in should the gushing petroleum come near Cuban shores. Those conversations have increased as Cuba prepares to drill for oil just 70 miles from the Florida Keys. Last year, the U.S. Treasury Department granted a group of environmentalists and drilling experts, led by the Environmental Defense Fund, permission to travel to Cuban to meet with top officials at the Ministry of Basic Industry, which regulates the energy sector, as well as the state-run petroleum company. The group included Reilly, the co-chair of a bipartisan commission that investigated the 2010 BP spill. He said his goal was to share the commission’s findings with Cuban officials, who had no experience regulating offshore oil and gas, in hopes that they wouldn’t make the same mistakes that led to the BP disaster. When he returned to the United States, Reilly briefed the Bureau of Ocean Energy Management, Regulation and Enforcement and other administration agencies, whose officials, Reilly said, were very interested to learn that the Cubans were reading the Interior Department’s regulatory reports and planned to adhere to American standards. “That was not known,” he said. 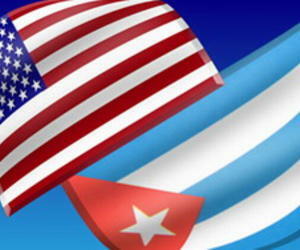 U.S. officials also have engaged with the International Maritime Organization, which has sent technical teams to Cuba to evaluate its oil drilling procedures, and Cuban and U.S. officials met in the Bahamas in December along with officials from Mexico and Jamaica to discuss disaster plans. A similar meeting was held in Trinidad and administration officials say more will come. “In fact, we’re all comfortable all the entities that would need licenses to respond appropriately either have them or are in the process of getting them at this point,” said a senior administration official, who requested anonymity in order to speak freely. Reilly notes that his delegation spent several days speaking directly with top Cuban officials and was able to gather specific details about Cuban plans that may not have been discussed at other multinational meetings. “On the oil and gas issues, we’ve been moderately successful in getting the two governments to start talking with each other,” said the Environmental Defense Fund’s Whittle, who helped lead the trip and had several meetings with administration officials. There are still considerable obstacles to be overcome. In addition to needing visas to travel to the United States, Cuban scientists work with fewer resources. The Internet also is not easily accessible. But Pina was supposed to be in the 2011 class. It took months to get proper approvals from U.S. officials, who were concerned the grant money would be taken or taxed by the Cuban government.